Just been to my local Co-Op and noticed behind the counter they had 75cl bottles of Madame De Maintenon Champagne priced up at £7.49. This was not a reduced price but the assistant confirmed it was the correct selling price? This used to be sold at £29.99 a bottle. Can't confirm if this is everywhere, but I picked up three bottles for Christmas and at £22.50 for three this has to be my bargain of the day. By the way this was in Gosport, Hampshire. It was £15 last year. Nor in St Albans or Harpenden. 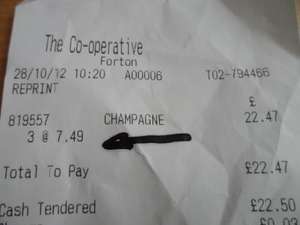 I got a deal for Sainsburys own champagne, which I found on money saving expert. Six bottles of their own champers, which I have tried before, and is very good, delivered for £46.25. It arrived at 7pm on Sat evening!!. Don't bother trying to find this deal. Spent an hour on the phone to Co op head office this must have been a pricing mistake as they say the cheapest they do this champagne is £13.99. It is available in the right Co-ops. I cleared out the Somerfield Road store in Ryde earlier. Stunning deal. of 6. We initially put in £20 to share a case with two others. I was stunned at the superb quality, so much so, that I purchased 4 cases straight after New Year. This champagne is at least equal to Moët Chandon in my opinion and is the same price as Moët ' off the shelf'. The Christmas Co-op offer (in Jersey) was through their online Dealmaker. This ended at around 10,00 p.m. On 4/1/14.